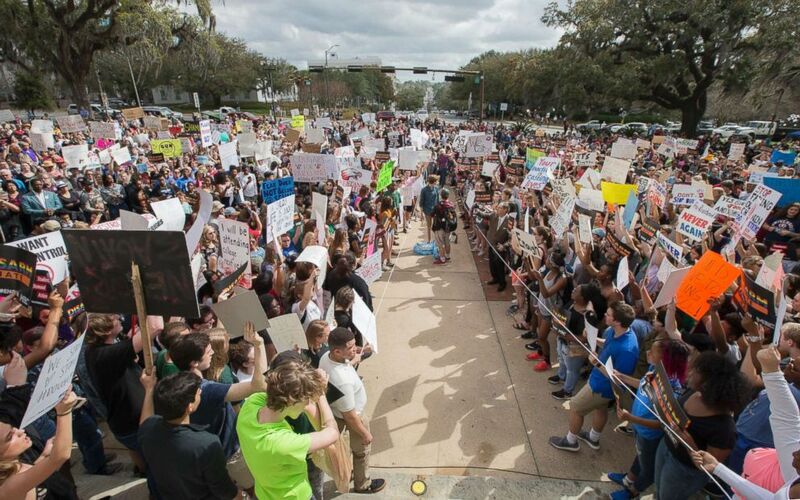 The march comes in the wake of the Feb. 14 mass shooting at a Florida school. Students, teachers, parents and their allies will converge on the nation's capital Saturday to rally for gun control and school safety measures in the wake of last month's shooting in a Florida high school. Thousands of people from across the country are expected to participate in the March for Our Lives, organized by students of Marjory Stoneman Douglas High School in Parkland, Florida, where a gunman killed 17 people and injured others on Valentine's Day. The accused shooter, 19-year-old Nikolas Cruz, was a former student at the school and was armed with an AR-15-style rifle he had legally purchased a year ago, authorities said. Now, students around the country -- using the slogan "Never Again" -- are calling on lawmakers to make schools safer and enact tougher gun control laws, such as prohibiting the sale of high-capacity magazines and banning the high-powered, highly-lethal assault-style weapons often used in mass shootings. 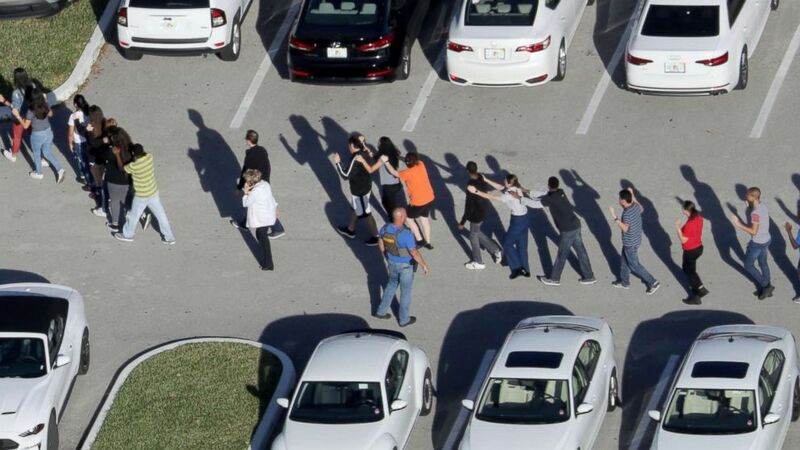 (Mike Stocker/South Florida Sun-Sentinel via AP) Students are evacuated by police from Marjory Stoneman Douglas High School in Parkland, Fla., after a mass shooting on Feb. 14, 2018. The main "March for Our Lives" event in Washington, D.C., will begin at noon ET on Saturday, more than five weeks after the deadly school shooting. There have been other events in support of the shooting survivors, including a National School Walkout on March 14 that lasted for 17 minutes to honor those killed a month earlier in Parkland and to protest gun violence across the country. 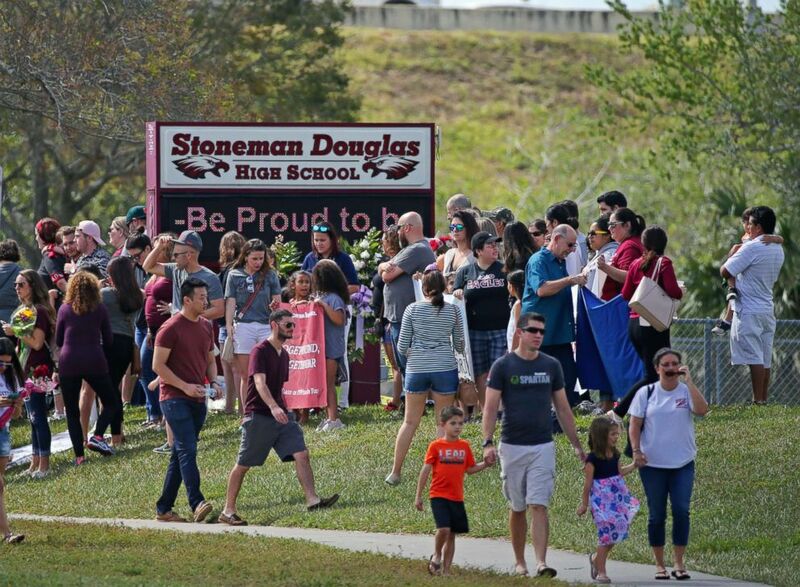 (David Santiago/Miami Herald via AP Photo) Parents and students arrive at Marjory Stoneman Douglas High School for an open house, Feb. 25, 2018. This was the first time students returned to the school since the shooting that killed 17 students. 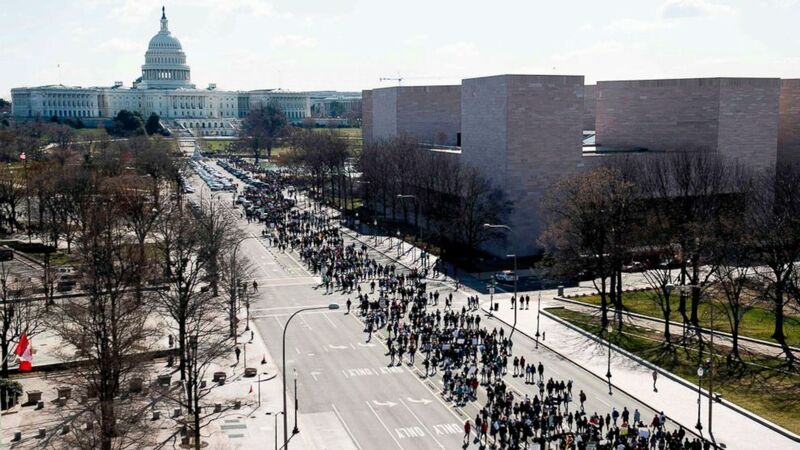 The main March for Our Lives event in Washington, D.C., will begin on Pennsylvania Avenue between 3rd Street NW and 12th Street NW. But there were hundreds of satellite marches, or "sibling marches," planned for this weekend around the world. Each sibling march is an independent, student-led initiative, according to the March for Our Lives official website. There were sibling marches planned in cities including Los Angeles, Chicago, New York City, Boston, Ottawa, Buenos Aires, Madrid, Paris, Dublin, London, Berlin, Stockholm, Rome, Tel Aviv, Mumbai, Hong Kong, Tokyo and Sydney, to name just a few. This Columbine survivor is now a mom, teacher. Here's why she's headed to March for Our Lives. (Mark Wallheiser/AP) Students gather on the steps of the old Florida Capitol protesting gun violence in Tallahassee, Fla., Feb. 21, 2018. Countless people, including a number of celebrities, have voiced their support for the march by announcing their plans to participate or donating to the movement's main GoFundMe page, which has raised over $3.4 million. Half of the funds raised via the crowdfunding platform will go toward the March for Our Lives Action Fund, which will cover expenses associated with Saturday's event in Washington, D.C. The other half will be given to the victims and their families of the Feb. 14 school shooting via the Broward Education Foundation. Actor George Clooney and his wife, Amal, a human rights lawyer, gave $500,000 to March for Our Lives and said their family will be at the event in Washington, D.C.
Media mogul Oprah Winfrey announced via Twitter that she will match the Clooneys' donation. She tweeted, "George and Amal, I couldn’t agree with you more. I am joining forces with you and will match your $500,000 donation to 'March For Our Lives.’ These inspiring young people remind me of the Freedom Riders of the 60s who also said we’ve had ENOUGH and our voices will be heard." Many celebrities, including singers Harry Styles, Mariah Carey and Justin Bieber, have also shown their support by signing a petition created by the March for Our Lives organizers that calls for action to end gun violence and protect schools. David Hogg, a student at Marjory Stoneman Douglas High School, announced on CNN that singers Ariana Grande, Jennifer Hudson, Miley Cyrus and Demi Lovato will be marching alongside him and the other organizers in Washington, D.C.
(Saul Loeb/AFP/Getty Images) Thousands of local students march down Pennsylvania Avenue to the U.S. Capitol during a nationwide student walkout for gun control in Washington, D.C., March 14, 2018. The March for Our Lives organizers explain on the official website that they support the constitutional right of law-abiding U.S. citizens to bear arms, but the recent surge of mass shootings, particularly at schools, calls for an honest discussion about guns.